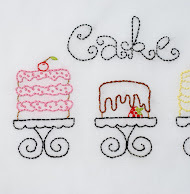 Time to share a new stitch I have learned from my 100 Stitches Plus list. This one is the Pistil Stitch - you can see from the above picture that it is the ideal stitch to use when forming part of the pistil of a flower! 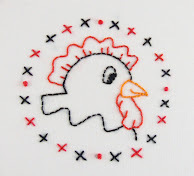 This stitch is very simple, it is basically a French Knot with a tail. I learned this stitch from the book Elegant Stitches by Judith Baker Montano.